The good folks over at Riot Fest have released the daily lineups for this years Riot Fest Chicago. You can go over to their site and view it all in one sitting or better yet, create your own daily list with their handy little app. 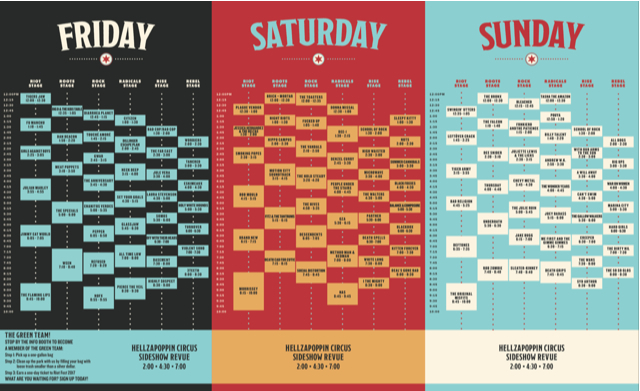 Riot Fest Announces Time Schedule for Chicago! Featuring The Original Misfits, Morrissey, Death Cab for Cutie, Ween, Flaming Lips, Rob Zombie, NOFX, All Time Low, Pierce The Veil, Social Distortion, Sleater-Kinney, Death Grips, Rufused and much more. Riot Fest has announced the daily band schedules for Riot Fest & Carnival in Chicago: check them out here. Headliners include Flaming Lips, NOFX & Pierce the Veil Friday, Morrissey, Death Cab for Cutie, Social Distortion and Nas on Saturday and The Original Misfits, Rob Zombie, Sleater-Kinney and Death Grips closing out the festival on Sunday. Riot Fest Chicago closes out the summer with a with a line up unlike any other festival. In addition to offering up artists that appeal to a wide range of fans, Riot Fest continues to have something for everyone, including Hellzapoppin Sideshow Review, a Ferris Wheel and Carnival games, and excellent food and beverage options. Outside of several reunions, including The Original Misfits, Thursday, Set Your Goals, The Anniversary and a rare appearance by Girls Against Boys ; several bands and artists will be performing their quintessential albums during Riot Fest 2016. Most notably, Julian Marley will perform Bob Marley & the Wailers’ Exodus on Friday, Social Distortion will be exclusively performing White Light, White Heat, White Trash on the exact date of the album’s initial release (Sept. 17, 1996) for a special 20th Anniversary performance in Chicago on Saturday while Rob Zombie’s first Riot Fest appearance will include an unexpected and exclusive album play of White Zombie’s Astro-Creep: 2000 on Sunday while The Hold Steady will also play (Boys and Girls in America) Saturday night. The Flaming Lips, Ween, The Specials, Jimmy Eat World, Julian Marley, NOFX, Refused, Pierce The Veil, All Time Low, Glassjaw, Pepper, Meat Puppets, Dan Deacon, GWAR, The Anniversary, Enanitos Verdes, Set Your Goals, Neck Deep, Highly Suspect, Fu Manchu, Girls Against Boys, The Dillinger Escape Plan, Tigers Jaw, Basement, Touché Amoré, Diarrhea Planet, Big D & The Kids Table, Citizen, Turnover, Violent Soho, Off With Their Heads, Holy White Hounds, Laura Stevenson, Somos, 3Teeth, Tancred, Jule Vera, Worriers, Eskimeaux, The Far East, Bad Cop/Bad Cop and Featuring Hellzapoppin Circus Sideshow Revue. Morrissey, Death Cab For Cutie, Social Distortion, NAS, Brand New, Fitz & the Tantrums, Descendents, Motion City Soundtrack, The Hives, Bob Mould, The Hold Steady, Method Man & Redman, GZA, Smoking Popes, The Vandals, Fucked Up, I The Mighty, The Toasters, Hippo Campus, Balance & Composure, People Under The Stairs, White Lung, Jessica Hernandez & The Deltas, DEE-1, Brick + Mortar, Night Riots, Plague Vendor, Microwave, Death Spells, Deal’s Gone Bad, Black Foxxes, The Walters, Nots, Donna Missal, Denzel Curry, Blackbox, High Waisted, Summer Cannibals, Partner, Kitten Forever, Sleepy Kitty, School of Rockand Featuring Hellzapoppin Circus Sideshow Revue. The Original Misfits, Featuring Glenn Danzig, Jerry Only and Doyle Wolfgang Von Frankenstein, Rob Zombie, Sleater-Kinney, Deftones, Bad Religion, Underoath, Thursday, Jake Bugg, Death Grips, The Julie Ruin, Joey Bada$$, Chevy Metal, Me First & The Gimme Gimmes, Tiger Army, The Wonder Years, Dee Snider, Andrew W.K. Leftöver Crack, Billy Talent, The Falcon, Juliette Lewis & The Licks, FrnkIero AndThe Patience, The Bronx, Pouya, Swingin’ Utters, Tasha The Amazon, Bleached, The Wans, Creeper, Marina City, Syd Arthur, The Dirty Nil, The So So Glos, Big Ups, All Dogs, War on Women, Hard Girls, A Will Away, Can’t Swim, With Our Arms To The Sun, The Gallow Walkers, School of Rock and Featuring Hellzapoppin Circus Sideshow Revue.